The San Bernardino attackers did not post support for jihad on open social media, contrary to previous reports, the FBI has said. Instead they expressed support for martyrdom using "private direct messages", said FBI boss James Comey. 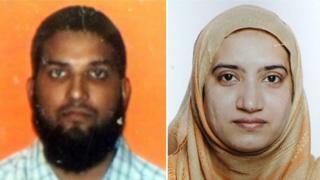 US security officials were criticised for not checking Tashfeen Malik's social media before admitting her to the US in 2014. Gun attacks by her and husband Syed Farook left 14 people dead. Families of the victims will meet President Barack Obama on Friday when he visits San Bernardino, the White House announced. But they did express support for jihad prior to Malik's admittance to the US when communicating using a major internet service provider. He declined to name which one, although the Washington Post quoted unnamed officials saying it was Facebook. Mr Comey said he did not know why the couple smashed up computer equipment and phones, but the agency had recovered some information from them. He also said that Muhammed Youssef Abduladeez, who killed four Marines and a Navy soldier in Chattanooga, Tennessee, this year, was inspired by a foreign terror group, the first such admission from the FBI. The FBI director also said that the way Islamic State militants were using social media to inspire people to commit attacks was providing a new kind of challenge. "ISIS [IS] has broken the model.. by out-sourcing terrorism via social media," he said. Malik came to the US on a fiance visa from Saudi Arabia. US security officials were criticised this week for apparently failing to detect social media posts by her that were sympathetic to violent jihad. New York Senator Chuck Schumer said: "Had they checked out Tashfeen Malik, maybe those people in San Bernardino would be alive". It sparked a debate about what limits were placed on security officials when doing background checks. They did eventually publicly post about jihad, however. Malik pledged allegiance to the leader of so-called Islamic State shortly after opening fire at a health centre in San Bernardino on 2 December. It was later removed.